"An opportunity is as real an ingredient in business as raw material, labour or finance. But it only exists when you can see it"
"Opportunities are there for everybody.... But they exist only if you see them... And you can see them only if you look for them..."
"Lost opportunities are the easiest to identify..."
Opportunities, and searching for them, are vital issues for the new-world enterprise. All along the Value-Chain, both internally and externally, there is an extreme need for valuable opportunities. When borders collapse; when globalisation is at the door-step; when competition becomes hotter and hotter; that's the right time to devote some serious attention to opportunities search. 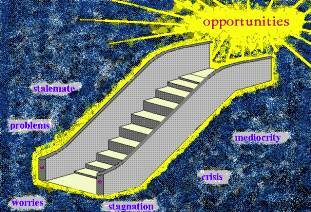 An opportunity is "....an evident course of action, with clear outcome value...." (E.De Bono). As such, opportunities are directly concerned with chain value. 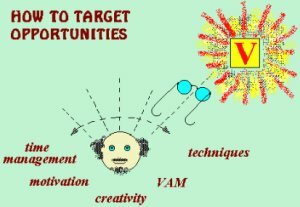 Target: exploitation of opportunities to maximise value generated and transmitted along the value-chain. Opportunities are not related to finance, technology, management abilities or commercial strength. Nor do opportunities require any of those factors to be produced. To the contrary, to be identified and exploited, opportunities require only hard, targeted, creative thinking, and the ability to learn and react fast. The world-class enterprise needs to set up a system and a strategy, by which everybody in the enterprise dedicates systematically time, efforts and thinking to the identification of potential opportunities. Besides being provided a number of creative tools, people in enterprises need to be sensitised to the importance of searching for opportunities, and provided with adequate spectacles to spot them. Knowledge and practice of healthy principles of Value Adding Management (more ») and Lean Thinking (more »); the ability to manage well own time; adequate self-motivation; and practical deployment of tools and techniques, gradually will give people a much clearer understanding of how to produce ideas and spot opportunities. this topic is now available in an e-course! !